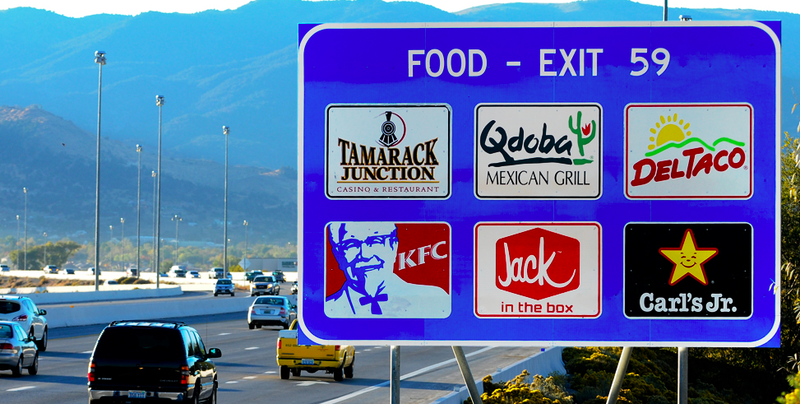 Drive down any major interstate in the U.S., and you’ll see big blue signs decorated with business logos near most exits. Here’s who decides which businesses make it on the signs, and how much it all costs. Called interstate logo signs or specific service signs, these ubiquitous big blue billboards are godsends to weary travelers searching for gas, food, or lodging close to the highway. Unsurprisingly, the signs aren’t solely there to help out motorists, as they also provide monetary benefit to businesses and, crucially, to the state. Roadside advertising programs are administered by individual states, though specific service signs like the one in the picture above tend to be farmed out to contractors. One of the biggest of these contractors is a company called Interstate Logos, which works with transportation agencies in 23 states to not only install the huge blue panels, but also to work with businesses to run the programs. Who’s Eligible To Be On The Signs? If you own a business that falls into one of these groups—attraction, pharmacy, camping, lodging, food and gas—and your business is located near a controlled-access state highway, then you’re eligible to get your company on the big blue sign. This could be a great opportunity to bring in more customers. But not everyone is eligible to display their firm’s logo; that’s because the state’s requirements are rather strict, specifying things like distance from the highway, operating hours, required amenities, and number of parking spots available. For example, as shown in the image above, Michigan requires that any gas station on a specific service sign be within six miles of the highway, and be open at least 16 hours a day, seven days a week and 360 days a year. In addition, the gas station must offer water, gas, and oil for various types of vehicles, as well as public restrooms and a public telephone. Requirements for food facilities are similarly specific, stating that facilities must operate continuously for 12 hours a day and six days per week. In addition, restaurants on the service signs must be within six miles of the highway, and offer 24 seats for patrons, a public bathroom, and a public telephone. Other states are even stricter; Colorado specifies that restaurants must offer drinking water and be open continuously between 7 a.m. and 11 p.m., and Kentucky limits restaurant and gas businesses to within three miles of a rural interchange or within only one mile of an urban interchange. But even if your business meets all the requirements, and you’ve submitted your online application, there may be competition from other nearby businesses. As for which of those businesses get to be on the signs, that depends on the state’s policy. Colorado rotates the businesses at the end of each contract year, but other states like Michigan give preference to businesses nearer the highway, while still others like Washington use a first come-first serve (with waiting list) approach. Signs generally come in three different types: mainline, ramp and trailblazer. Mainline signs are the huge ones that motorists see on the main highway just before exits, ramp signs are found on either side of an exit ramp and usually feature an arrow and a distance to the destination, and trailblazer signs are found along the route when driving to a business from the exit ramp isn’t straightforward. The cost of getting on a specific service sign varies by state, but in general, it spans between about $500 and a couple grand per year. For some states, the annual fee depends solely upon which kind of sign a business is renting, though other states base the annual fee on how much traffic that particular road sees (a sign along a more crowded road costs more). Washington’s fees, for example, vary based on traffic and location. The example table on the Washington Department of Transportation site—shown above—displays annual costs between $360 and $910 for two signs (one in each direction). Michigan charges a flat fee of $850 per mainline sign (this comes with a ramp sign as well), so advertising on both sides of the road—one sign for each direction—means businesses have to pay $1,700 each year to advertise on the highway. Florida does things a bit differently, setting rates based on things like “population, traffic volume, market demand, and costs for annual permit fees.” In Florida, the maximum annual fee for a “sign location” in an urban area is $3,500, while $2,000 will get a business a sign in a rural area. Texas breaks up the cost of Mainline signs and small ramp signs, but also uses daily traffic count to determine cost. Mainline signs cost between $900 and $3,250 per year, and smaller ramp signs cost between $150 and $750 per year. Colorado’s fees are $750 per direction for a mainline, a ramp sign and a trailblazer. These are just a few examples, but on average, it looks looks like if you want your business on a big blue highway sign, expect to shell out about a grand per direction. Typical mainline logo signs are about 48 inches by 36 inches, so based on WSDOT’s ballpark figures, it’s probably safe to figure about $300 to $500 per sign (this agrees with the Lexington Herald Leader’s claim of $1,253 for four logos). Add the annual fee to the cost of making the sign, and any removal/change fees (usually around $100), or fees for additional trailblazer signs (typically about $50), and businesses in some areas could end up spending close to ten grand per year for the advertising for a pair of signs (though most businesses will likely end up spending just a couple of grand). If traffic is heavy enough, and the business is well-recognized among motorists, this could be worth it. As for the state, the program seems like it’s definitely worth it. The Lexington Herald Leader, in its report about Kentucky logo signs, says the state gets 35 percent of all logo sales and six percent of what are called “tourist-oriented directional signing” (text-only signs on state routes). The sites says that in 2010, Kentucky Logos—contracted by the Kentucky DOT—paid the state $618,904.91. That’s great for the state, but according to the report, of the businesses on the 1,568 signs in the state, only 1 to 2 percent leave annually. So it seems the businesses are happy, too. That’s not surprising. Those damn blue signs are hard to ignore.